Paris Marathon training continues. 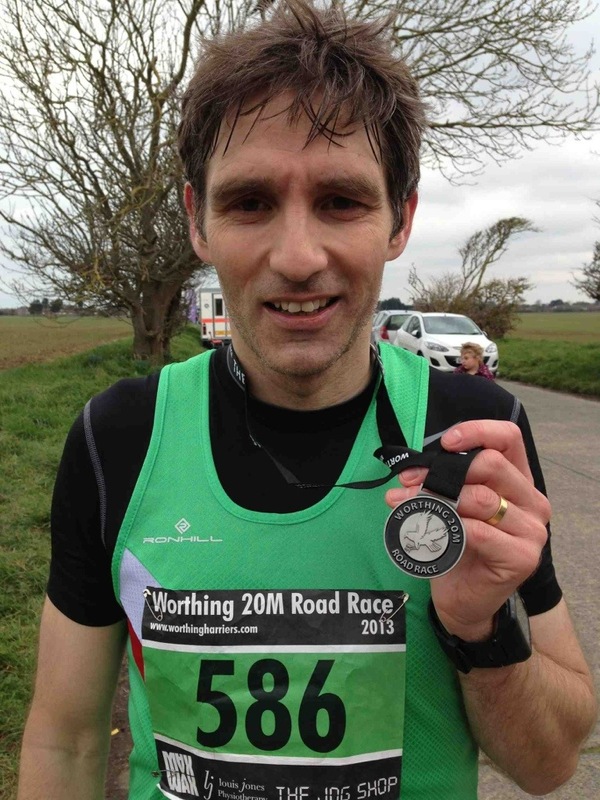 On Sunday 10th March I took part in the Worthing 20 Mile Race. 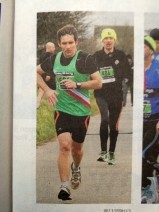 Last year I ran in the same event and it was a bit of a disaster. It was the event which convinced me that my stomach doesn’t like gels. 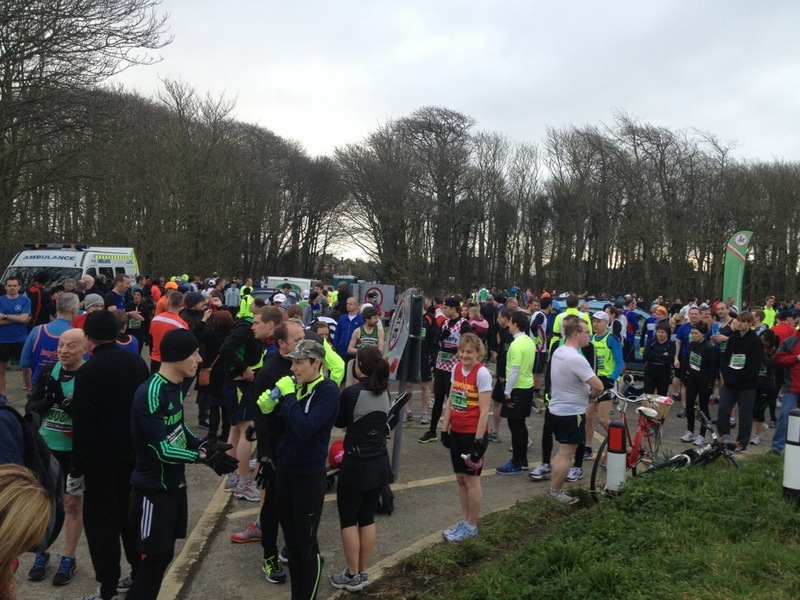 I had decided to take a gel every 5 miles, something I had never done in training. Big mistake. I was running well until I got to 17 miles and then I began to feel incredibly sick. 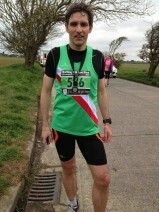 I had to stop running at 18 miles and eventually dragged myself over the line in 2hrs 48mins. This year, having learned from the previous year and having got my nutrition a little better sorted, though not perfect by any means, I ran a lot better. The course is four laps of a five mile loop, through Goring, West Sussex. It’s not the most beautiful route in the world but if I’m going to run a marathon I have to get these miles under my belt. The weather was also not the greatest. 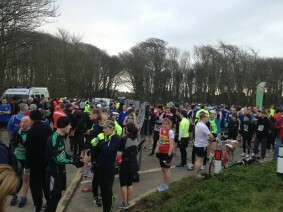 It was very cold and became more windy as the race went on, which meant that for the mile and a half along the seafront there was a strong headwind. Having dispensed with gels, I now use GlucoTabs every 2 miles and the occasional GU Chew. This seems to sit better on my stomach. The only snag is that GlucoTabs have only 4mg of carbs per tablet, which isn’t really enough. It’s still a work in progress this nutrition thing. I kept to my plan of just under 8 minute miles until the 15 mile mark and then definitely slowed a little. However, my goal was to finish in 2:40:00 and I made it home feeling fairly strong in 2:39:05. I came 133 overall out of 477 runners and third out of my running club team mates. The two ahead of me finished in 2:15 and 2:21, so they are a lot faster than me. My worry is that I was slowing badly towards the end and I can’t afford to lose any time in the marathon if I’m to finish in 3:30:00. On equal splits I would have to run the final 10k in 50 minutes which, on any normal day, would be easy. However, I fear that I may struggle to do that having run the previous 32k. I have one more long race left, Hyde Park 20, before Paris. I’m also doing a lot of swimming lately, which I really enjoy and I hope is improving my stamina and cardio function. I’d love to come in under 3:30 in Paris, but I have to be realistic. A PB would be absolutely fine too and that means I need to come in under 3:43. I am going to go for it though. 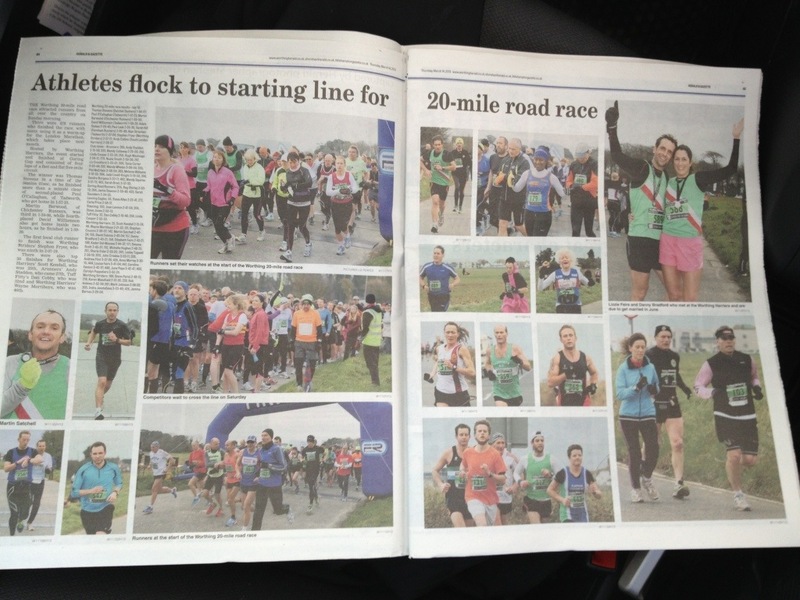 Finally, I made the Worthing Herald newspaper! 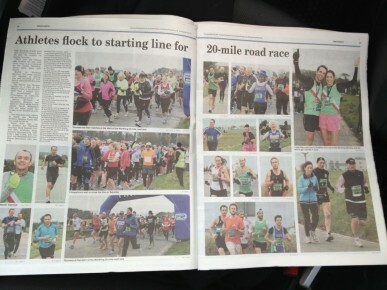 My photo is top left on the second page of the spread.